In a world where international terrorism, the war in Iraq, and control of Middle Eastern oil are topics at the forefront of world discussion, it's surprising that a film that deals with all of those issues would treat them so indifferently. Discussion and exploration of complex themes are not at the forefront of Peter Berg's The Kingdom. Action is. For a film that tries to be Syriana meets Black Hawk Down meets (as many other critics have pointed out) CSI, The Kingdom displays none of the insight of Syriana, the gutwrenching power of Black Hawk Down, or the gripping entertainment value of CSI. Instead, the film opts to squander any potential it had to explore the grand international themes that were set up in the film's excellent title sequence, and descends into a rote, predicable shoot-em-up. 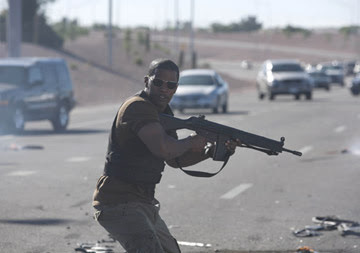 Jamie Foxx stars as Ronald Fleury, an FBI agent who leads a team of investigators (played by Jennifer Garner, Chris Cooper, and Jason Bateman) into Saudi Arabia against the government's wishes to investigate a terrorist bombing that killed two of their agents. Once there, they face an unfamiliar culture that becomes increasingly hostile as they get closer and closer to catching the terrorist mastermind who plotted the attack. It's a plot that's just begging to be connected to foreign policy and the history of the region. But it isn't. Berg manages to whittle down years of turmoil and political unrest into hyperkinetic gun battles with faceless Muslim extremists. Why are these people the way they are? Why are they trying to kill us? Are they crazy, or did we help make them this way? Berg never tells us, nor does he even attempt to even ask those questions. "Why does it matter?" You may ask. "Not every movie has to have any deeper meaning." That's true. But I believe that it is an artist's responsibility to interpret the world around them, to process it and make sense of it. There are much bigger things at work in the world of The Kingdom, but we never see any of it. It's what separates this film from something like Paul Haggis' In the Valley of Elah, a film that takes a single event and ties it in to current events with beautiful subtlety. With so much relevance to today's world, The Kingdom the film should resonate more than it does. But it doesn't. Berg does try in the final moments of the film to make a statement about the endless cycle of violence, but the moment is so hamfisted and forced that it comes out of nowhere, and doesn't mesh with the personalities of the characters as they have been developed up until then. It's a sad waste of a subject rife with possibility - a dumbing down of complex themes into violent action fodder for the masses - kind of like our own current foreign policy. Hmmm...maybe The Kingdom has a message after all.